Gladio: In 1980 was Bologna I, Now is Bologna II. Nuke again? Two people have died and at least 55 others are injured following an enormous explosion on a highway in Bologna, Italy, according to the ANSA news outlet. The explosion was heard just before 2pm in the Borgo Panigale area, on the outskirts of the city. There are differing reports regarding the number of people casualties. The Rai news outlet is reporting that as many as 100 people are injured. At least 14 of the injured are in a serious condition. The fire then spread to a carpark beneath the overpass, where several other vehicles caught fire and exploded. Several blasts were heard over the course of nearly 10 minutes. Video footage from the scene shows huge columns of billowing into the air following the blast. Several social media users captured footage of the massive explosion which showed an enormous fireball bursting into the sky. The explosion was caught on film and posted on Instagram by Bologna resident Michele Palma. It shows a dark column of smoke quickly followed by a violent eruption of flames seemingly filling the entire adjacent street. Witness Marco Rosadini was in a nearby restaurant when the incident occurred. He told La Repubblica that he initially thought it was an attack. “With the explosion, the glass roof of the restaurant started to collapse. People started to run away,” he said. Deputy Prime Minister Matteo Salvini paid tribute to the emergency services that responded to the blast. “My thoughts are with the victims and the injured of the terrible explosion of Borgo Panigale, and a heartfelt thanks to the 100 firefighters who promptly intervened on the spot,” he wrote on Facebook. 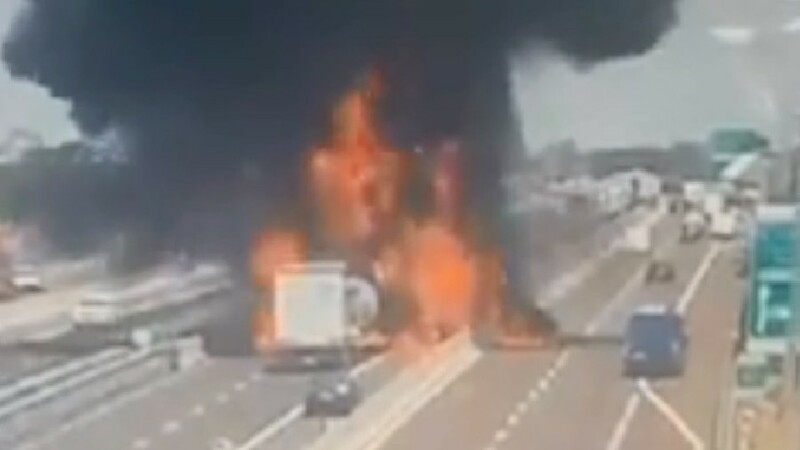 Shocking footage of a truck carrying flammable liquids crashing into a vehicle and causing a massive explosion on a Bologna highway has been released by the Italian police. Some 100 people were injured and at least two killed. The video shows a tanker truck smashing into another vehicle, which seemingly stopped due to a traffic jam on the highway. It appears that the driver didn’t hit the brakes before the collision, which then caused the tank to dislocate and swiftly erupt into a deadly inferno.